It’s common for parents to think that their infants and toddlers have extraordinary abilities, but uh — this one definitely does. As in, we just saw a kid snuff out a candle with a soccer ball. That’s right. Korbin Jackson is only two, but he’s already doing things that’ll make you feel like he’s an Olympian in training. That’s probably why his parents set up an Instagram account for him that showcases his many skills. 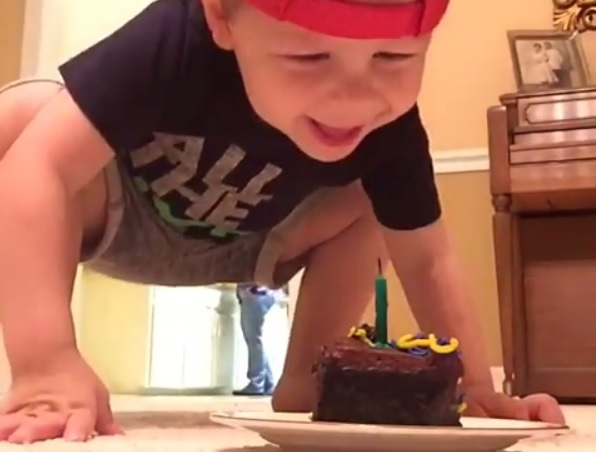 Not only does the account show off his basketball and ping pong skills, but it shows how he celebrated his past birthday — by literally “blowing out” his candle with an impressive soccer kick. He also looks absolutely adorable in the process. So really, this kid is multitasking. We don’t blame you if you watch that on loop. It’s that good. It’s so incredible to also see how proud he is of the accomplishment. In fact, Korbin’s pride is obvious in all of his videos. For example, this one proves he’d totally win all the prizes at the fair. But, his interests don’t stop at sports. He’s also a heck of a singer. We think Taylor Swift might want to plan a duet with him in the near future. To see more of Korbin’s impressive moves, just check out his Instagram. We’ve got a good feeling that more stunts will be uploaded soon.